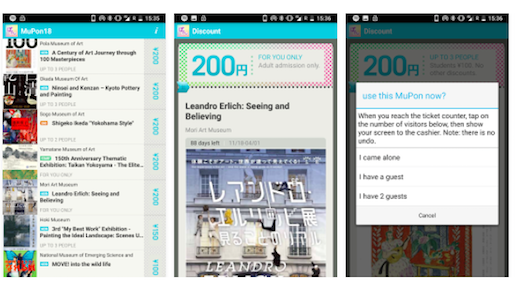 MuPon digital discounts put Tokyo art and culture affordably at your fingertips. 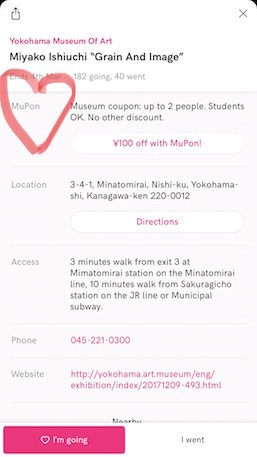 MuPon museum coupons by Tokyo Art Beat bring you news and discounts on exhibitions and other art events in Tokyo and the Kanto area. Save money on shows at popular museums like Mori Art Museum and The Watari Museum of Contemporary Art – all you need to do is carry your smartphone! MuPon’s special selection is not limited to museums, either. You can also get into art fairs, festivals, performances, and other cultural events for less. To start using MuPon, just download the Tokyo Art Beat app for iPhone or the MuPon app for Android. 130,000 people have used a MuPon discount to date, and our goal is to continue bringing art into people’s lives. With this in mind, we’ve integrated 2018 MuPon for iPhone into the Tokyo Art Beat app. Sign up for ¥120/month or ¥1000/year. There’s also 2018 MuPon for Android, which offers the same discounts through the end of 2018 for just ¥1000. If you’re an iPhone-using art fan in Tokyo or the Kanto area, you’ll definitely want to try out the Tokyo Art Beat app. 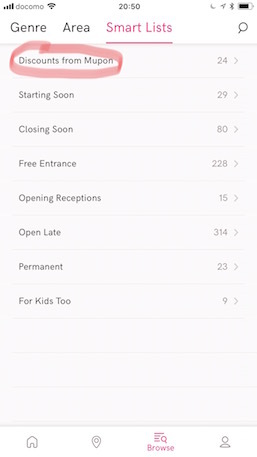 In addition to built-in MuPon discounts on 20 to 40 events every month, subscribers can enjoy great features like bookmarks for shows they’ve seen or want to go to, keyword searches, automatically updated lists of new events on TAB, and follow functions for the latest shows at their favorite museums and galleries. We recommend the ¥1000 one-year option, which lets you enjoy more art for less money for a full year starting from your subscription date. There’s also a one-month free trial! MuPon for Android brings discounts, event info, and other great features only an app designed by art fans could offer. Notifications for openings and closings make sure you’ll never miss another exhibit! Info on show dates and hours make it easy to see what’s on now, so you can head out on your next art adventure without a hitch. Whether you’re an iPhone or Android user, you’re sure to get plenty out of MuPon and the TAB app. Check out the full list of MuPon-eligible shows! You can also follow MuPon and Tokyo Art Beat on Twitter.